I love cookies, in fact they were the first vegan thing I had ever made that tasted equal to its non vegan counterpart. I fawned over this years Bon appetite Christmas cookies, the challenge was veganizing them. I love isa chandra moskowitz cookie recipes but I have been wanting to adapt some of what I have learned and branch out on my own. 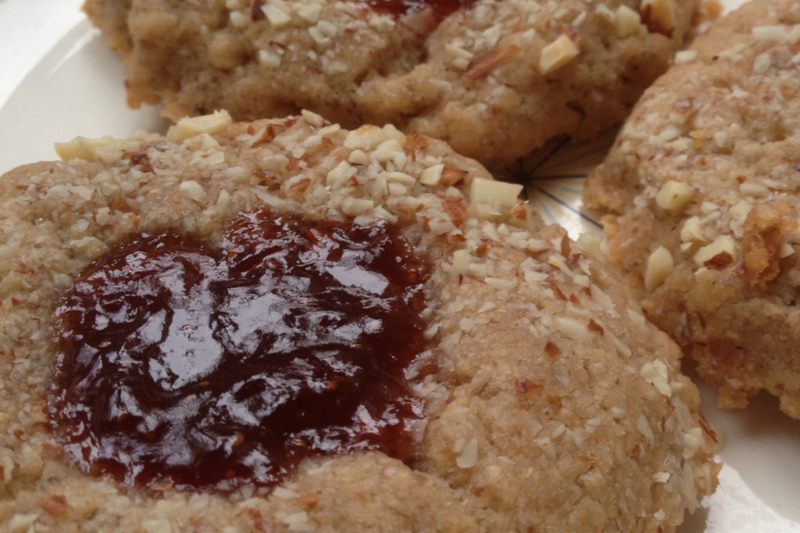 Vegan cookies are incredible, but I had never made a cookie with jam in the middle of it before, so I read up and found a pretty amazing recipe from Sweet Vegan. The only issue is that she uses egg replacer in almost everything in her book which leads to a chalky flavor that is not so great in cookies! Not only was there egg replacer there was also other starches in her gluten free recipe! Here are the same cookies without the awful finish, and they have plenty of gluten. I used flax powder as my egg which works because the nutty flavor compliments the almonds, and used whole wheat pastry flour instead though spelt would work great here! 1. Preheat oven to 180 degrees Celsius or 350 degrees Fahrenheit and line a baking sheet with parchment paper or silpat. 2. Using a hand mixer or fork mix together butter substitute and sugar until light and fluffy. Add the almond and vanilla extracts and mix until combined. Next add the flax seed mixture and stir until well combined. Sift in the flour and salt and mix till it is well incorporated. Put the dough covered in the refrigerator for an hour to chill. This will help when forming the dough. 3. After chilled take the dough from the refrigerator and roll the dough into 9 equal balls, I use a ice cream scoop for this as my cookies will be perfect in size and bake evenly. Roll the balls over the chopped almonds, and then push your thumb into each cookie. Finish off by adding the half tsp of strawberry jam (trust me strawberry is the best combination) and put on the tray to bake for 14 to 16 min, or until lightly browned. Because there is no baking power or soda these cookies wont expand as much in the oven. 3. Take out the cookies from the oven and place on wire racks to cool. For storage use airtight containers. These cookies will please even the most picky omnivores!